I was at a really great military spouse event on Wednesday (thanks, USO!) and someone mentioned that BAH doesn’t always cover the cost of housing. 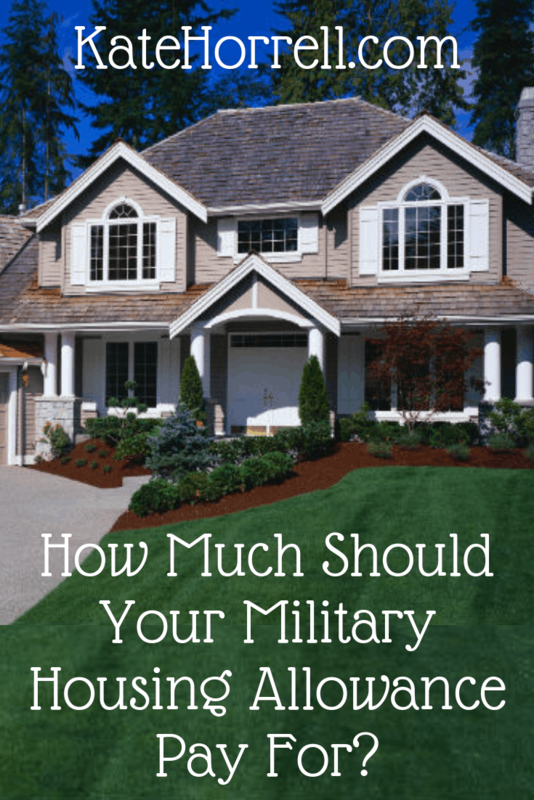 It’s true that a lot of military families spend more than their BAH on housing. I hear things like this all the time, something along the lines of “I don’t know who makes up these numbers” or “BAH isn’t enough” or “they keep cutting BAH even while housing costs have gone up.” And it’s absolutely true that in many markets, BAH isn’t going to cover the housing that folks want to live in. But as I listened to this discussion, I realized that the problem isn’t that the numbers are made up (they’re not,) or that BAH isn’t “enough” (it does exactly what it is supposed to do), or that BAH drops while housing costs increase (yes, there has been a tiny cut to BAH overall, but not enough to create this widespread problem.) The problem is that the BAH housing allowance are based on an outdated concept of the size and type of housing a military family is “supposed” to occupy. As a preface to this, you have to really understand how BAH works. It’s anything but random. A private company is contracted to gather housing and utility costs from around 300 Military Housing Areas. They collect data in the summer and use housing listings, talk to management companies, consult with real estate professionals, and work with the local housing office(s). They identify neighborhoods where the average income is similar to the total military compensation of a service member who would be eligible for that unit, and they pick houses that are geographically representative of the market as a whole. They work with local area installations to ensure that they’ve eliminated unsafe areas. They don’t use data for anything that isn’t a true apartment or house – no mobile homes, no age-restricted neighborhoods, seasonal units, furnished units, income-restricted housing, or efficiencies. The utilities portion of the equation is determined using data provided by the annual American Community Survey conducted by the Bureau of the Census. This data is then applied to the formula to determined the actual housing costs for each paygrade and dependency status (with or without dependents.) Based upon the changes to the law, the service member then sees 96% (2018) of that calculated amount, dropping to 95% in 2019. Here’s where I think the actual problem lies. From the BAH Primer, “The Services have agreed to housing standards that allow members to receive a BAH that correlates to what civilians who earn comparable amounts would pay for housing. That is, we use housing standards to link housing costs with a particular paygrade.” This makes total sense, right? You have to base housing costs on something, and so there is a list of how much your BAH should be able to pay for, based upon rank and dependency status. The problem is that this standard figures BAH based on smaller properties than the average service member expects to be able to afford. Here’s the list for service members with dependents, but first let me explain it a little. The second column is the size house that the military thinks that rank should be living in, sort of. The third column is how the exact cost is calculated. If your rank doesn’t rate one of the “anchor point” size houses, they take the lower housing type/size and the next housing type/size and figure out the difference. They they adjust the allowance to be the percentage between the two type/sizes. Does that make sense? Maybe the problem isn’t the BAH process or formula, maybe the problem is the housing standards. As far as I know, the current BAH housing standards were set when the current BAH formula was put into place in the 1990s. I think they were probably outdated then, and are even ore outdated now. Today’s military families generally expect to live in larger houses than their grandparents did. As the military looks to retain a qualified, all-volunteer force for the next 10, 20, or 40 years, they need to address the issues that are upsetting military families, and housing allowances are a constant subject of frustration. What do you think? Do the current housing standards meet your expectation of appropriate housing for your service member’s rank? Have you lived in housing that aligns with these standards? I think people should be grateful for what they get. Civilian jobs dont get a housing allowance they have to use their paychecks. Live within your means or by what the military gives you. Imagine not having BAH at all. Housing allowance is part of the pay package, it is based on where we are stationed. If housing allowance doesnt cover basic housing, then it cuts into basic pay. Our military members work overtime and work holidays without receiving any extra pay and for less than somepeople make working at McDonalds. My husband has served for over 20 years and only makes 56k in base pay. He worked 66 hours this week. Well if the military was earning civilian paychecks by the hour for basic pay, then they truly wouldn’t need BAH to cover any housing expenses. Working over 60 hours a week would cover everything at $20-$25 per hour. Second the comment above: I think people should be grateful for what they get. Civilian jobs dont get a housing allowance they have to use their paychecks. Live within your means or by what the military gives you. Imagine not having BAH at all. We survived when it was 80-85% BAH covered costs as a junior enlisted/officer family and actually did better with our finances. 2.Plus, would you rather have a higher base pay or higher BAH? You cannot have it all! Plus robbing Paul to pay Peter makes it worse. On the flip side, can you imagine what would happen to retention if military service members did not receive BAH? Not because they are ungrateful, but for a lot of junior folks, BAH is a very large percentage of their total military compensation. An E-5 making less than $3000 a month literally would not be able to be stationed somewhere like the Pentagon. Heck, even for my rather senior husband, BAH makes up 22% of his total compensation. And that’s a serious consideration when those civilian jobs are beckoning. It’s still an all-volunteer force, and I think we all want it to remain that way. It’s time for BAH calculations to be updated. There’s no reason an officer family of 4 needs a house bigger than an enlisted family of 4 – so why do they get more in BAH? Rank does not equal bigger housing needs. Your right, it is outdated. The without dependent and with dependent rate differentiation should be re-looked. One reader commented its part of “compensation” and I agree, BAH is considered part of a members overall compensation. Tell me what organization, outside the military, pays you based on your dependent status whether it be one or ten? A single member works the same hours, performs at the same level and does the exact same job but can make hundreds of dollars less a month. Equal pay for equal work. The BAH conversation is much bigger…and should be normalized. To the folks saying BAH shouldn’t be given, it’s something servicemembers should be “grateful” for, etc. : When you’re in the military you don’t have the same opportunity costs as civilians, you don’t have the privilege of choosing what housing markets you live, for how long, or have the ability to multiply your retirement savings by buying a home and staying in it. Every move costs money, time, effort, disruption in your spouse’s income opportunities, civilian retirement plan, etc. If anything, comparable salaries for civilian jobs have far higher upsides and bring with them the ability to benefit from labor protections that military service waives. Aside from the historical reasons housing and food are covered as part of service, in an all-volunteer military, you are competing with civilian employment. For college graduates, that wage gap and opportunity gap are (generally) much wider than for folks without an undergraduate degree, or graduate degree. If anything, the military should recalculate BAH in terms of losses in the housing market servicemembers experience because they are unable to stay in place and build equity. In some markets, that’s negligible, but, for our family, we’re leaving a huge amount of potential equity because of the West Coast housing market versus where most of these military bases are located. Adding in all the future medical care costs that are potentially waiting for us after my spouse finishes his infantry career and not having that home equity to rely on will cost us in ways the pension won’t compensate compared to civilian opportunities. Civilian contractors doing the work of our infantry are paid 6-figure salaries, have much fancier health plans and their retirement benefits packages are insane. Not to mention per diem, etc. when they work overseas. There’s no comparison. Our military are undercompensated based solely on what we pay civilian contractors for the same job and BAH/BAS don’t even begin to bridge that gap.